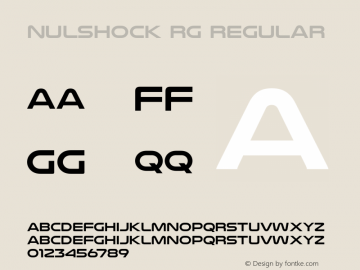 Nulshock Rg font family series mainly provide Bold,Regular and other font styles. Nulshock Ul font family series mainly provide Regular and other font styles. Nulshock Hv font family series mainly provide Regular and other font styles. Nulshock El font family series mainly provide Regular and other font styles. Nulshock Bk font family series mainly provide Regular and other font styles. Nulshock Lt font family series mainly provide Regular and other font styles. Nulshock font family series mainly provide Bold,Regular and other font styles. Nulshock Light font family series mainly provide Light and other font styles. 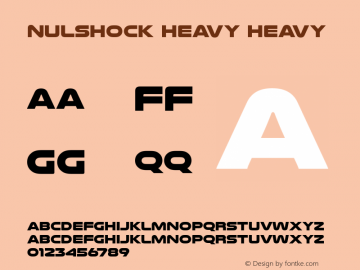 Nulshock Heavy font family series mainly provide Heavy and other font styles. Nulshock Book font family series mainly provide Book and other font styles.